For a long time, we’ve been wanting to have more control over Atom’s startup code. In November of last year, as part of this effort, we created an in-depth issue that carefully described where time was spent when opening an Atom window. We realized that many of the operations happening during startup were redundant and that we could use the information we knew at build-time to minimize their cost. While this constraint was remarkably restrictive, we still saw a great potential in using snapshots as a tool to make our startup situation better, and so we started experimenting with different approaches that could allow us to use them in Atom. One of them was to try using V8 native APIs to load Node/Electron into the snapshot context so that we could work around the limitation of not being able to use modules like path, fs, etc. This turned out to be non-trivial though, especially because some of the modules that Electron and Node access when they boot up rely on native code, which is very difficult to deal with in snapshots. Therefore, in order to circumvent some of the restrictions discussed above, we started exploring a simpler approach. Specifically, we decided to defer the usage of forbidden APIs until runtime so that all the other computation could still happen as part of the snapshot script. To do so, we set out to create a tool that automated this process without compromising code readability: electron-link. As you may remember from the previous section, requiring native modules or using Node APIs is not the only forbidden operation in V8 snapshots. In fact, DOM APIs can’t be accessed either when requiring a script. This was quite challenging from a technical standpoint, because many of our bundled packages used jQuery or HTML custom elements. The former used some feature detection techniques that relied on DOM globals, while, in order to use the latter, objects needed to extend the HTMLElement class, which is not available when generating a snapshot. To solve both of these issues we could have taken some shortcuts by, for example, patching jQuery to stop performing feature detection at require time. However, we realized that neither jQuery nor custom elements were providing any tangible benefit to our users. In the case of jQuery it was quite the opposite, as sometimes it would cause unnecessary DOM reflows and a slower user experience. As such, we decided to take this as an opportunity to remove them from the codebase and improve Atom’s code quality. For the most curious, #13254 provides a summary of all the work that went into this process, along with the relevant pull requests. Resolving the module, as explained in Node’s documentation. 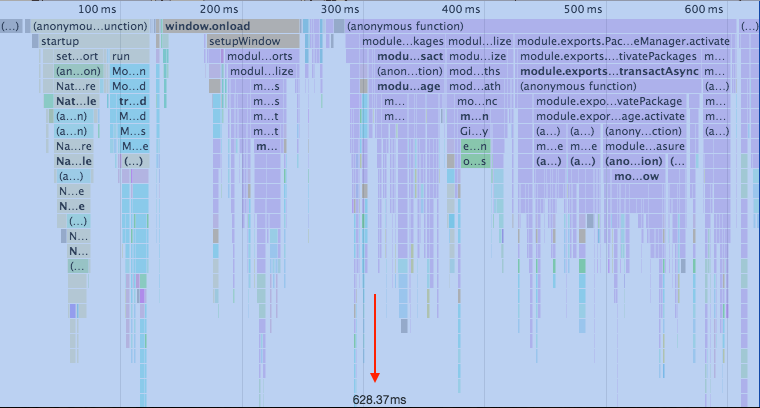 You can notice how a lot of it is spent in Module._compile and require. On average it took ~ 0.9s-1.0s to load a stock Atom window and activate its packages when no editor was open and the tree-view was closed. By using snapshots, we were able to cut this cost down to ~ 0.7s-0.8s, thus improving startup time by 15-20%. For more details, please check out #13916. Even though some of these tasks are dynamic (e.g. reading the user’s configuration), others are repeated every time a new window is created and, thus, waste CPU cycles and I/O resources. Similarly to what we did for requiring modules, we used snapshots to improve this code path, making it two times faster. For more details, please check out #14024. Almost every package that ships with Atom has a style sheet that customizes its appearance; considering that we ship 58 packages, we decided to bake all the core style sheets into the snapshot in order to make them already available when loading core packages at runtime. This resulted in a ~ 100ms improvement on a fast machine with an SSD but, since most of this work was I/O bound, we expect it to be even more noticeable on slower hardware. For more details, please check out #14038. For more details, please check out #14080. This marks the end of the first round of performance improvements to startup time. 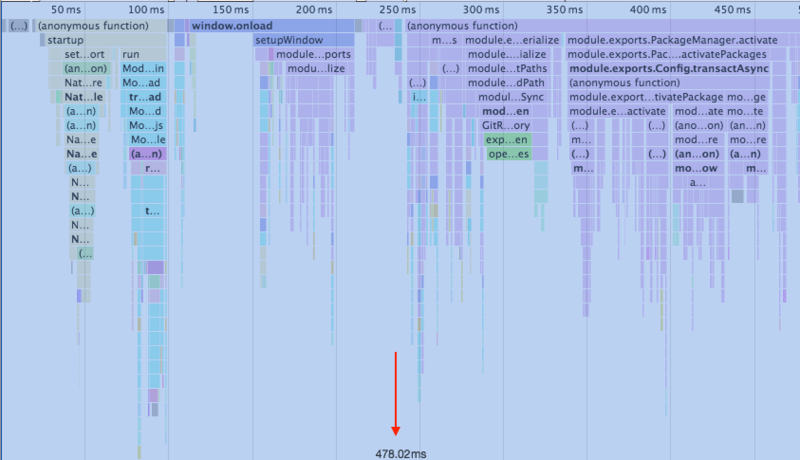 Overall, on a stock installation, we made loading Atom almost 50% faster and snapshots were a crucial tool that enabled some otherwise impossible optimizations. 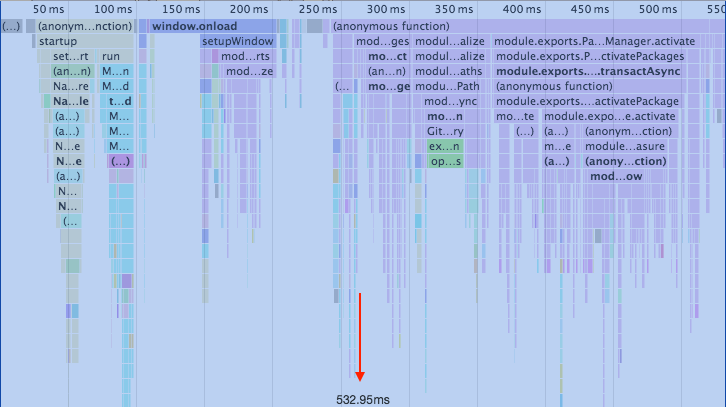 Performance continues to be one of the concerns the Atom team cares about the most. We believe there are still many things we can do to reduce startup time even further and, in the future, we would like to explore an approach where we take full advantage of Electron’s multi-process architecture. Specifically, the main process (which was not affected by the improvements described in this blog post) and the renderer process could load almost in parallel, as opposed to the current situation where we fully load the main process first and only then spawn child renderer processes. As always, we will keep you posted as we make progress on these enhancements. In the meantime we hope you will enjoy opening your editor faster with Atom 1.17 Beta!